This novel is as compelling as it is bitter, tragic, and heartrending. In the first gripping, gut-wrenching scenes of Kevin Catalano’s darkly beautiful Where the Sun Shines Out, a kidnapping unfolds with clockwork efficiency and terrible, far-reaching repercussions. It is the summer of 1992. Ten-year-old Dean Fleming and his younger brother, Jason, attend an annual celebration of The Wizard of Oz. Left alone for a moment, they are abducted. Dean manages to escape alive; his brother does not. 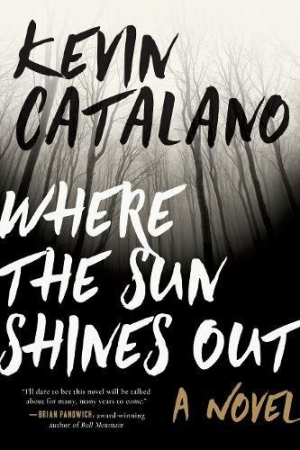 Over twenty-five years and with a half-dozen major and minor characters, Catalano weaves together a raw, complex portrait of a steel town reeling not only from the murder-kidnapping, but from a steady social and economic collapse. Poverty, creeping like rust, is all around in this deeply felt literary thriller. Ten years later, Dean is an angry, lonely, frustrated man bent on inflicting pain on his only friend. Brutality and tenderness are knotted tightly together in this story: fathers hurt sons, friends hurt friends, husbands hurt wives, everyone disappoints everyone. The prospects are terribly bleak for these characters—even Henderson Lovely, the last surviving munchkin from the Oz film, makes an appearance as a sad, broken old man. Some will no doubt find Catalano’s gloomy characters and plot points too heavy, but the writing carries the story through the years without letting go of the hope that these lives can somehow right themselves. “The majority of his existence had been like a rusty plow scouring the earth wherever he went, ruining those he came in contact with,” the narrator says of the main character. Still, he’s striving for redemption—like everyone else—and his path is as compelling as it is bitter, tragic, and heartrending.